HIV/AIDS is the deadliest pandemic in recent history: it has killed twice as many people as the First World War, but the progress made in a mere 30 years against the disease has been spectacular. Today, someone who takes antiretroviral (ARV) drugs every day has a very low risk of developing AIDS and can live a long and fulfilling life. However, over 75 percent of the people living with HIV in West and Central Africa — five million people — are not on ARV treatment and therefore condemned to a slow, painful and unnecessary death. The situation is even worse for the 730,000 HIV-infected children in the region: 90 percent don’t have access to ARVs. Urgent action is needed to change this situation. It may be the case in western countries, but not worldwide. In fact, the face of HIV globally today is a young woman. Fifty-nine percent of people living with HIV in sub-Saharan Africa are women. In South Africa, girls age 15-19 are as much as eight times more at risk of HIV infection than their male counterparts. Forty-five percent of all children who are born with the virus come from West and Central Africa. Why? Because their mothers didn’t have access to treatment. A pregnant HIV positive woman on ARV treatment has less than a two percent risk of transmitting the virus to her baby. Thanks to ARVs, the number of children born with the virus worldwide has been cut by 60 percent since 2000, and last year Cuba became the first country to declare that it had completely eliminated mother-to-child HIV transmission. But again, this victory depends on the availability of ARV treatment. In West and Central Africa, only 39 percent of HIV positive pregnant women are on treatment, which is why the region accounts for close to half of the births of HIV-infected children globally. Those babies are born with a disease that could have been prevented, 90 percent of these HIV positive babies in this region do not have access to pediatric HIV treatment either. Without treatment, about one-third of children living with HIV will not survive past their first birthday, half will not celebrate their second birthday and only one in five of these children will celebrate a fifth birthday. Although condoms are very effective in preventing HIV infection, they’re not the only way. Studies show that optimal ARV treatment reduces the risk of transmitting the virus by 96 percent in couples in which one is HIV-positive. New drugs even allow HIV negative people to be protected against infection. Promoting the use of condoms is an important tool against HIV, but people need a combination of prevention tools to choose from, to fit best with their situation. Offering ARV treatment for all is a key component to get the HIV/AIDS pandemic under control. This is why it’s a huge problem that so few people – less than one in four – have access to treatment in West and Central Africa. Without treatment for all who need it, everywhere, the chances of bringing the global pandemic under control are very slim. 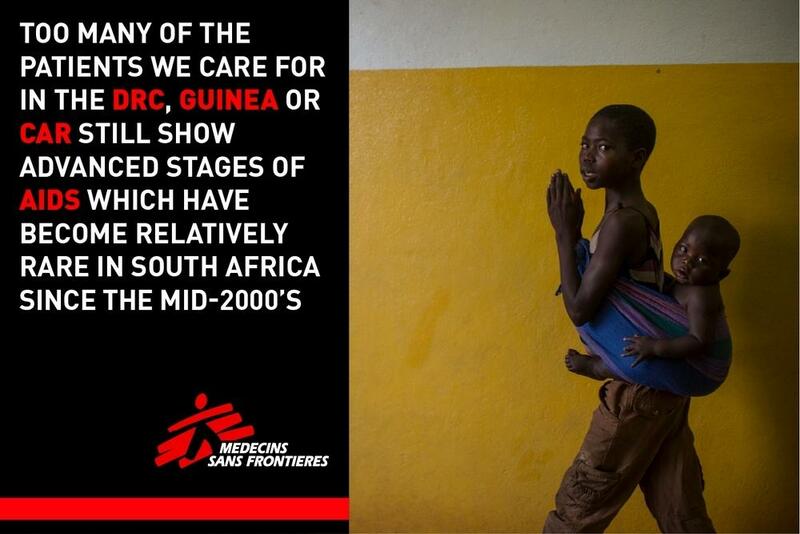 This is why MSF is calling for an urgent, ambitious catch-up plan for countries with low coverage of ARVs. South Africa has, by far, the largest number of people living with HIV — 6.8 million — and AIDS still takes a staggering toll on the country with 140,000 deaths a year. 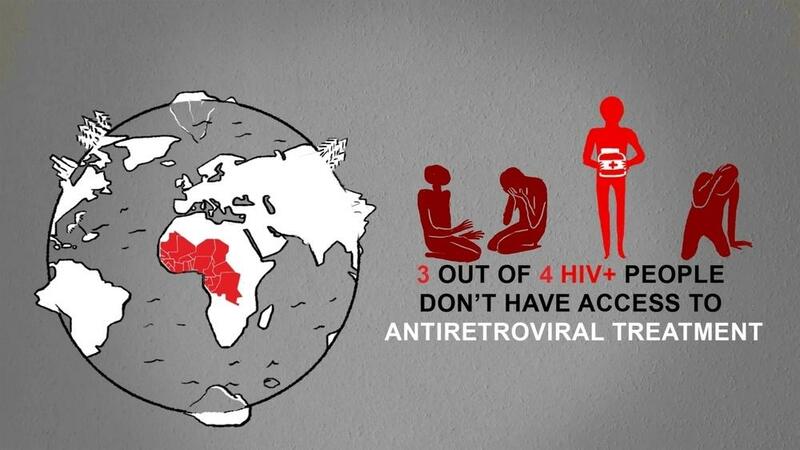 But this number remains below Nigeria’s, which has half the number of HIV positive people. Why? Again, it’s simple: Nigerians have less access to ARVs than South Africans — 22 percent versus 45 percent. In short, in places where antiretroviral treatment is not widely accessible, more people suffer and die from HIV/AIDS. Logic suggests that the Democratic Republic of Congo (DRC), where ‘only’ 1.2 percent of its population is living with HIV, would be better able to provide ARV daily treatment than Malawi. After all, both countries are relatively comparable on paper in terms of GDP per capita or human development. Yet Malawi has managed to put 50 percent of its HIV-infected population on ARVs. The DRC, less than 25 percent. West and Central African countries are in need of a quick and drastic catch up plan. WCA has 6% of the world population, but 17.9% of the people living with HIV It accounts for 27% of all Aids-related deaths, 21% of all new infections, and 45% of all children born HIV+ This is explained by a low coverage of ARVs. Only one in four adults are provided with treatment. There are 5 million people in this region alone that need ARVs, which represents 1/3 of UNAIDS' target to getting 15 million extra people on ARV drugs by 2020. The main HIV actors are calling for a drastic acceleration in the fight against HIV/Aids The world has five years to get the epidemic under control by reaching 90-90-90 by 2020 (90% PLHIV know their status, 90% of them initiated on treatment, 90% of them virally suppressed). If not, the epidemic will rebound by 2030 and the considerable investments made in the past 15 years will be lost. West and Central African countries are in need of a quick and drastic catch up plan. Doesn’t make sense? Well there are some explanations. If, as in the DRC, HIV is less visible in society, media and political agendas, it gets lost among many other health priorities. This seems to make sense, after all, even health systems in rich countries are already under strain to provide treatment for growing numbers of people with chronic conditions: diabetes, obesity, etc. So imagine the situation in a country like Malawi that needs to provide daily HIV treatment for 10 percent of its adult population, even though it has six times fewer health workers than the minimum recommended by the World Health Organization. In fact, the most noteworthy progress against HIV/AIDS has been achieved in resource-poor countries. The introduction of ARVs in the 2000s was the single most important factor to increase life expectancy in Southern Africa. Just because a country has limited resources or a context is complicated or unstable doesn’t have to mean that people living with HIV cannot be provided with ARV treatment.